World of Warcraft player Doubleagent has reached game's max level without leaving the Pandaren starting zone. 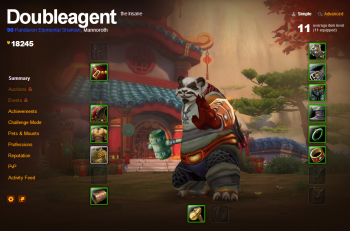 When we last checked in on World of Warcraft player "Doubleagent" - the "factionless" Pandaren shaman - he had just dinged level 60. Now, he has fully completed his journey, and reached level 90, the game's current max level, without choosing a faction. He is World of Warcraft's first ever "neutral" max level player. So how did he do it? How do you get to level 90 when you can't leave the starting zone, where the maximum level of the monsters is 10? Through mining and herbalism. "Picking herbs, mining, and quests. Initially there was also mob kills, zone quests, and possibly exploration, but it's been a very long time since I've gotten any experience from that," explained Doubleagent, when asked how he pulled off this unusual feat. He says he has been working on the character off and on since September 2012. As for why he did it, it basically boils down to the age-old reason why any man ever does anything: to prove someone wrong. "I probably would have given up on it awhile back had my friend not suggested that I would never be able to do it. But now I will be able to say I have a 90, max level, of every faction." For those wondering why he didn't just use the instant level 90 boost, apparently using the boost with a Pandaren character forces you to chose a faction. Doubleagent says he plans to continue to level his neutral shaman to level 100 when Warlords of Dreanor comes out.